Okay gang I could use some help. Have pulled two families together. Me with two kids and her with one. The 1965 Volvo 220 didn’t quite do it and the 1940 Hudson was just right for five. Now we are adding a number six. Want a replacement for the Volvo and Hudson. Requirements are: Fun and interesting. Can fit five plus a baby seat. Easy to work on as it is a way I am teaching the kids how things work. Does not have to be too reliable as I drive 9 miles one way and have backup modes of transport. 60s and 70s station wagons are getting really expensive and unless you put a lot into them are boring (not including the Studebaker). 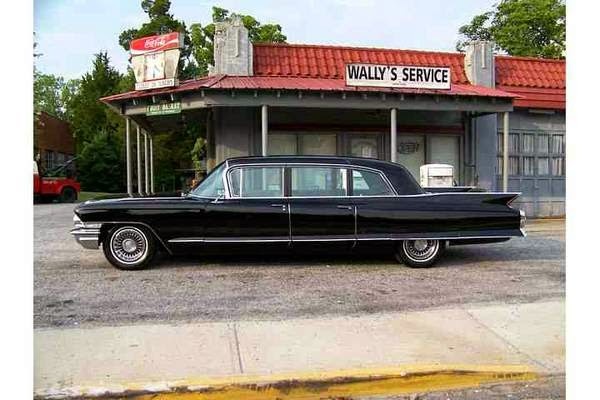 At the risk of getting DT put on the list of websites that Scot's wife bans him from visiting, I'm going to suggest this 1962 Cadillac Fleetwood 75 offered for $18,500 in San Rafael, CA via craigslist. The 25 foot monster should have seating for 9 if my internet sources are correct (3 rows of 3) and the 5500 lb monster should drink high-test through its 390 cubic inch V8 like Rob Ford on a bender. Being a daily turista I would like keep it under $15k if in really good condition or $10k if it has needs. Since the oldest kid is almost 10 years old they all have to be in the back. Big bench seats are a plus for many reasons but I cannot use them for the kids up front. Older is good for the looks and being able to work on it with the kids. Loved the style of last week's Falcon Econoline. Something like that, with the seats or a Jag Mk2 airport limo, hey a guy can dream. A long roof for a bike rack is a plus. Should have seen the Hudson with a bike rack. Front or rear wheel drive are both okay. Live in San Jose so no AC is okay. Heart transplants are good, auto trans not so, but that can be fixed. Prefer stockish look or mild custom. Thanks for the help and keep up the good work on the site. 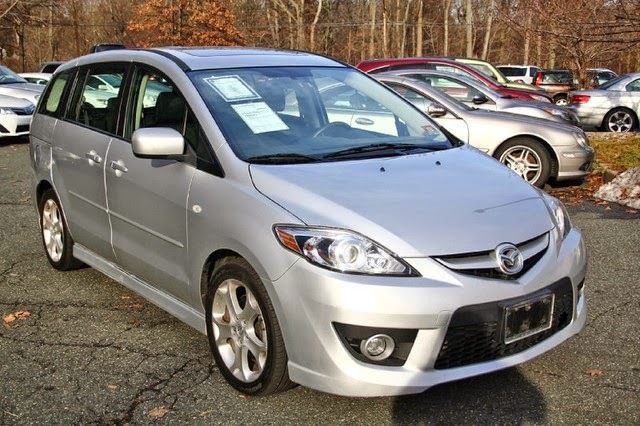 On the other end of a lunatic spectrum is this 2008 Mazda 5 (with 5-speed manual and 3rd row seating) offered for $6,995 buy-it-now here on eBay located in Mountain Lakes, NJ. The small Mazda people carrier has the footprint, fuel economy, and handling characteristics of a sedan, but the seating setup of a mini van. The only available US setup is for 6 passengers, but rumor has it that ordering a center jump seat from Japan will let you seat 7. What do you suggest for Scot? Uh oh, kaibeezy and I had the same idea. That has been for sale for quite some time now. Surprised to see it. The third seat is easily retrofitted. Just buy what you need online and in about an hour, you've got seated for 7 (at least 3 must be children). Or, look around and find one with it already. There are plenty. Ford LTD wagon or any other 80's equivalent? You guys and your family truckster infatuations.............No, what's needed here are limos.........Cadillac limos. The cool part about the limo approach (non-airport version) is that they can be easily transformed into a camper for the weekends! Plus, what better ride to do double duty in your Uber side business, use your kids as little valets/butlers/shoe-shiners for any deserving rider. The airport versions are great for families because the (everybody facing forward) enforces the "quit pinching your sister" rule and also provide some easy snoozing for long road trips. Plus you can always put 2 or more of your favorite S-Cargo, or Thule luggage containers on the top for that Dugger-wannabe look. Be careful with extra long vehicles, many modern metros restrict street parking for cars above a certain length. For instance, you cannot park any car or truck or car-trailer combo longer than 22ft on any city street in Redondo Beach overnight without a (free, but limited in days) permit. The law was designed to stop people from permanently street parking RVs in parking impacted neighborhoods, but it causes many vehicles to be effectively outlawed unless you have adequate driveway space. Check with your local municipality for restrictions. Boring, but Kia Rondos with 7-passenger seating are nicely depreciated. The Mazda5 sport, the cheaper one, is indestructible, super safe, handles fast and like on rails, great highway mileage at 30plus in my experience, and sits up just high enough not to be a SUV or truck. I like them so much I bought 3 for my kids. They are 2008s as the later ones have a bigger and less responsive engine..from a 2.3 to a 2.5.... Don't know why but the smaller one is much better. If you have to cram 2 more in it the way back seats pop up. My daughter uses hers to haul her harp around and the sons for tons of musical electronics. I love these cars. I concur, save for the rust issues and the dismal small overlap crash test scores, Mazda5s are incredible. Plus, having kids and also having some jackass park too close, it's nice to have sliding rear doors. Only thing keeping me from buying one for the wife is that there's no middle seat in the 2nd row. It seems Cosmo or Pintrest or whatever women read these days said that you are an unfit mother if you don't belt your child's carseat into the middle position of the first row of seats behind the driver. @Bobinott - I had use of one briefly as a departmental company car about 5-6 years ago. No issues with tires that I was aware of but definitely rust around the rear wheel arches early on in its life. I live in a salt-free area now and really want one again. Unfortunately, current one was beaten with the same ugly stick that hit the previous gen Mazda3 and they didn't sell enough around my home base for there to be anything in the 2nd hand market. No rust or tire issues at all, and I am in north east Ohio. The same tires on my volvo v50 and '98 318ti last half as many miles. I do know if you don't crank the rear calipers all of the way open when you do brakes they won't auto adjust with the hand brake correctly. The first brake job on the daughters was at 60k, and the sons at 80k miles. I bought them used with 2 year lease miles on them for $10k . They have beat the crap out of them, but no failures yet. Land cruiser would be my second choice. Audi C4 S6 Avant with the fold down seats in the back. This 1963 Fairlane V8 wagon should be easy to wrench on. Just a weekend of easy work to give it that surf look and you are set. Proposing something like this is tough without knowing the spouse (no, I don't mean biblically.) If we're talking the typical spouse, you're looking for a Honda Odyssey and the year, features, and condition are a function of the wallet. A little more wallet puts you in a Merc GL450/GL550. The Merc R-class is maybe even nicer if you're not going skiing, but a 'Mercedes minivan' has image problems. Any of the three-dozen Merc R63s ever sold on the market now? At least with MB you can probably count on getting parts for the thing. Some guys would gravitate toward an old VW Bus. I'd personally propose a Suburban of whatever vintage he thinks tolerable. I've owned enough of them now that...well, everything else in the driveway is FUN or USEFUL, but the Suburban is ESSENTIAL. Oddball: Toyota Previa with the supercharger. Impressive number of these still on the road relative to the original number sold. If the wallet is deep and the desire to be unique compelling...Divco milk truck, but building one to a daily-driver standard is gonna be a killer. Off topic a bit...I don't know if we just got a lemon, the R-class that our family had was the biggest POS that I've ever driven. Great to drive but it was hard to tell really because it was constantly in the shop. None of the MBs would fit their budget, I think. Maybe an old, raggedy T1N. I love the Previa idea. We loved ours until it snapped the driveshaft. But, we bought it cheap and I sold it for more than we paid for it. If they could find a clean one, that would be a neat option. We didn't really get a lot to go on. I got the impression that the guy wanted something older, but clearly other DTers read it differently. Would the Previa and Odyssey be too new? Thanks gang. We are following up on two of them. She likes the '57 Chevy for the looks and I like the limo in Tampa for putting 6 bikes on the roof. Back up is the Fairlane. Had a sycro Westy. They are great but with current prices I am guessing that this will be outside of the budget. Love the idea of the Divco milk truck with bench seats, shorty school bus style. Will check on the local ordinances for parking a limo on the street. For the money you want to spend and the functionality you need and for the future of you children, I 2nd Honda Odyssey--one of the big ones. Keep your kids safe with anti-lock brakes, crumple zones, etc. Those big old cars will just fall apart when hit--look up the highway fatality statistics for their era. Buy a fun car for when you dont need to haul everyone. I can't tell what the seating situation is now, but this Previa looks like fun if you like being outrageous! Have an Odyssey and will keep that as the long distance (over 9 miles) and freeway car. I agree that they are a wonderful appliance and much safer than a ’57 Chevy. To mitigate the safety I always drove the Volvo 220 and Hudson on surface streets. None of which had a speed limit above 35. I plan to do that with this car as well. I know it does not eliminate the safety issue. An overriding desire for an older car and an interesting ride is for the kids. Excuse me while I step up on my soapbox. I work in the semiconductor industry. There is a trend that has been accelerated with cell phones to see the world around us as black boxes and magic that cannot be understood nor challenged. I would like to use the old car as a learning tool so that the kids can see that these things in our lives are designed by people. With understanding a carburetor a fuel injection system can be explained along with the algorithm that controls it. It is not too far from that to understanding how a self-driving car works and that humans made the rules for the car to follow. The goal is not to have the kids be mechanics but rather to give them the tools to make informed choices. Scot..I had a '67 Mustang Fastback which was incredible and my daughter enjoyed it when she was really little, but she actually likes our '65 Sportwagon better because it is the absolute antithesis of her daily dose of Volvo XC90. She loves that everything is so basic and easy to operate. The common element in both cars is that there was no rear seat in the Mustang and the '65 Buick came without seatbelts in the back, so at less than 12 yrs old (here in CA) she can legally ride in the front seat of either car! My only absolute in old cars is updating the brakes to dual circuits. I've had that spontaneous brake failure in two cars which is pretty disconcerting when you've just been driving at highway speeds moments ago. That's just plain awesome, Scot. Please keep us abreast of what you guys decide and if we can find more cars for you! I do this all the time (find suitable cars for people). I don't do it for any reason other than I love to. But what upsets me most is when people don't ever tell me the upshot after I've done a bunch of research for them. I'd like to know what you guys end up doing. That's the payoff for all of us that thought about it ad nauseum! A) I agree with you....I do the same for folks. B) If you're like me, you get upset a lot. Here's my usual experience: People ask me for help with suggestions, knowing I'm a car geek. They might tell me they want a used minivan, and give me a few purchase criteria. After I spend a couple hours finding the best choices, and send them some local examples for sale at a reasonable price, they go and buy a new Chrysler 200 convertible. Precisely! It's ridiculous. And no amount of logic can change their minds, once it's been made. Man! I think I just stumbled across the support group that I've been looking for! I've been doing the finding cars for free since the '70s. I sold cars for a living (for a couple of years) because I liked hooking people up with the right car for them. It was never about the $$ and always about the satisfaction. What amazes me is that retail buyers walking into a dealership really appreciate that difference, but people who are getting it for free discount your experience and end up going a completely different direction because they got 'spun' by someone trying to sell them something. 2009 Kia Borrego: A completely unknown, rare SUV that nobody even knew existed. Only available for one year, it’s an amazing bargain and very solidly built; $11,800 (private party) to $13,500 (dealer). Actually usable third-row seating – for adults! Mercedes E350 AWD: Occasional 3rd row, typically poor MB reliability (but better than they were in the past) and high maintenance costs, 2009 = $25,800…wagon no longer available 2010+? Again, I was trying to get her to buy used. I don't believe new cars are a good idea in any way, shape or form. A new car purchase is for the flippantly rich and folks too lazy to do any research, in my eyes. I don't care if you're buying an Accent or an R8, unless it's the first year of production and you absolutely must have that car, there's no reason not to save thousands. Well guys, both the wagons with rear seating and limos have been eliminated. Wagons due to risk of rear end collisions and the limo as it takes up too much room on the street. Now looking at a few '60s vans. Thanks for the update, Scot! Even the modern wagons (V70) and the Yukon? My guess is that they have a higher level of safety than a 60s van, though there's certainly a lot of metal in one of those old tanks. Unfortunately, it's probably rusty. Old is going to equal less safe, unfortunately. Unless you install a roll bar. Seems like you might have two requirements that aren't meeting in the middle - you want old, but you want modern safety for the passengers. And from what you wrote, the first one is losing out. No worries, there are plenty of cars that still meet your specs (other than the old and easy to work on thing - but by going more modern you'll have less to worry about in terms of things going south because they're antique and worn out). What about a 2011 Ford Flex? It has an old school vibe (strap a surf board to the top!) and contains the latest in safety. Nothing says fun like a 1990 Suburban "Tonka" truck for only $3K...leaving you a large budget to add a roll cage, fix the seating and safety belts (racing seats with harnesses!). I'm certainly no expert on the subject and I have to rely on what and how the various organizations rate vehicles just like everyone else, but I do find it interesting that many people equate mass with safety. I want my cars to have enough power and handling to take evasive maneuvers smoothly and confidently, while having a braking system that’s not overpowered by the weight of the vehicle. I’ve driven several mainstream SUVs that have none of those features – and they’ve been bought by the millions. Clearly, many folks think if their vehicle is bigger and heavier than anything they might encounter, they’ll survive most anything. But like fighting, there’s always somebody bigger than you that will come along sooner or later. That isn’t my idea of safety. While I’ll admit there are surely times where the opposite is true, there are times where a Miata is a safer vehicle than a Ford Expedition. The Ford literally cannot get out of its’ own way because of the mass, weight and physics. When I bring these things up, owners stare at me like I’m crazy. Maybe I am. But, I have the feeling they don’t like thinking about how their $50,000 SUV isn’t necessarily all that safe, in the big picture. Not to mention all of the safety tech that's out there, much of which is not applied to SUVs and trucks. Too bad these posts are so ephemeral here on DT. It's a bummer that it will disappear nearly instantaneously unless somebody replies. Ah well. Thanks for the link, kaibeezy. That's a really interesting article and it's nice to know that I'm not alone in my thinking. The Sienna is arguably the best minivan out there, but I still feel like the Honda is a bit sportier to drive. Just my opinion and I love the whole "Swagger Wagon" marketing. Now that Tonka Truck would be a kick. Love to take you up on the falafel offer. address is se7en dot scot at gmail dot com.